Prior to talking about this particular grilled cheese sandwich, which was very delicious, I want to update the GrilledShane world on a few things. I know I have said it before, but this is especially true now. I am going to give you, my devoted reader, a bigger insight into the behind the scenes world of trying to grow the GrilledShane brand. I have already started doing this on GrilledShane’s Facebook page, but I also hope to do it more right here on the blog. It may be a short post, but hopefully the audience interested in what is going on with the GrilledShane brand will only increase. 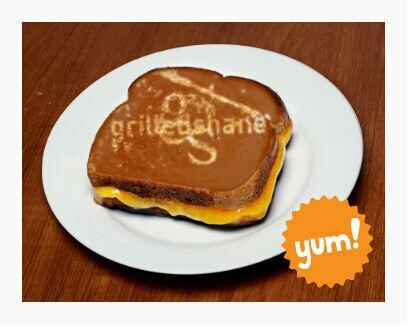 I am trying to figure out if I can truly turn the GrilledShane brand into something larger and hope you will join me on the journey. My first step was to join Pinterest. Hopefully you will join me there. Whoever is running Tillamook‘s Twitter feed is awesome, pure and simple. It seems we have bonded, as much as one can through letters typed on a computer screen. One such Twitter conversation is a must read for all. And how about this photo made by Tillamook!? 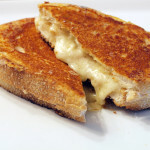 Due to this awesome connection, and how friendly they have been with me and the GrilledShane brand, I figured it was only right that I feature their cheese in my next grilled cheese sandwich. Plus, I haven’t had Tillamook in forever, so I thought why not?! At first, I thought I wasn’t going to be able to find any Tillamook varieties in my area as Tillamook’s “Where To Buy” tool told me it wasn’t available in my area. Thankfully, that tool was wrong and I was able to find some Tillamook at Whole Foods (and Heinen’s). Oddly enough, the only variety available had “Kosher” big and bold on the front. How could I go wrong? Our vegetarian-friendly Tillamook Kosher Medium Cheddar is just as creamy and flavorful as our regular Medium Cheddar, but officially made under rabbinical guidance. I couldn’t. I was hoping to find their sharp cheddar, but their mild cheddar definitely did the trick. I like a bite to my Cheddar cheeses and the Tillamook Cheddar did not disappoint in the least. Add in smooth and creamy and you have the makings of a great cheese. Delicious. Now, I will need to find and try other varieties of Tillamook cheese to see if they are awesome as this particular Tillamook Cheddar was. If you have yet to try any variety of Tillamook, I would highly recommend; you will not be disappointed. Since I was focusing on the Tillamook Cheddar and my new griddle, I didn’t want to go too fancy or out there when creating this grilled cheese. I wanted the cheese to shine through and allow the unique cooking process to take over. 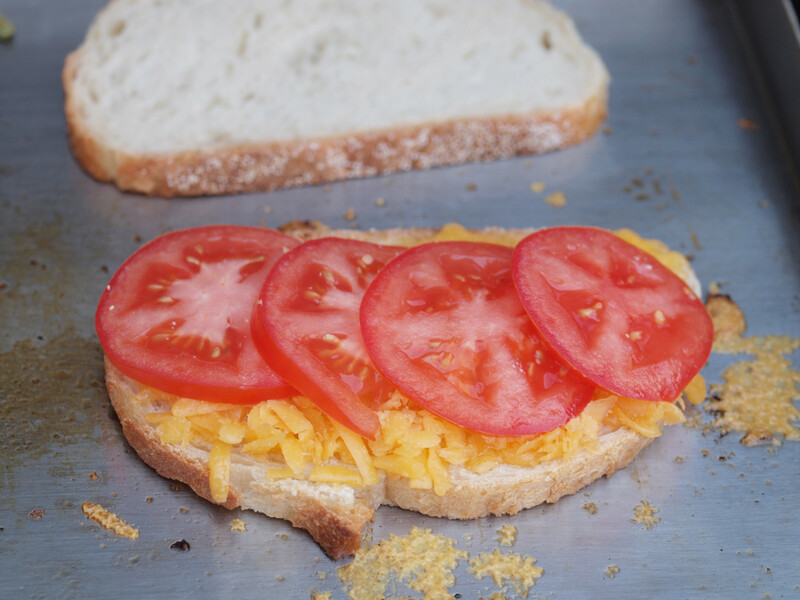 Therefore, I simply included fresh tomatoes in the grilled cheese. 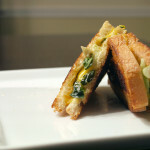 As I said, I was focusing on the Tillamook Cheddar and Sizzle-Q, so I went simple with this grilled cheese. That included the bread as well. I bought a loaf of Italian bread from Whole Foods and I was on my way. A little more than a week ago, I received an email from Paul at Little Griddle offering to send me one of their Sizzle-Q griddles to try out and possibly write about on the blog. 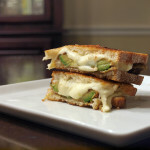 I was all for it as I have always been interested in making a grilled cheese on the grill and wanted to try it again. My only previous time trying to use a grill ended up with my almost burning the grilled cheese so I thought this might help. The Sizzle-Q is a 14 gauge 430 stainless steel cooking surface that fits easily and securely on your outdoor barbecue grill, providing you with a whole new world of outdoor cooking possibilities. 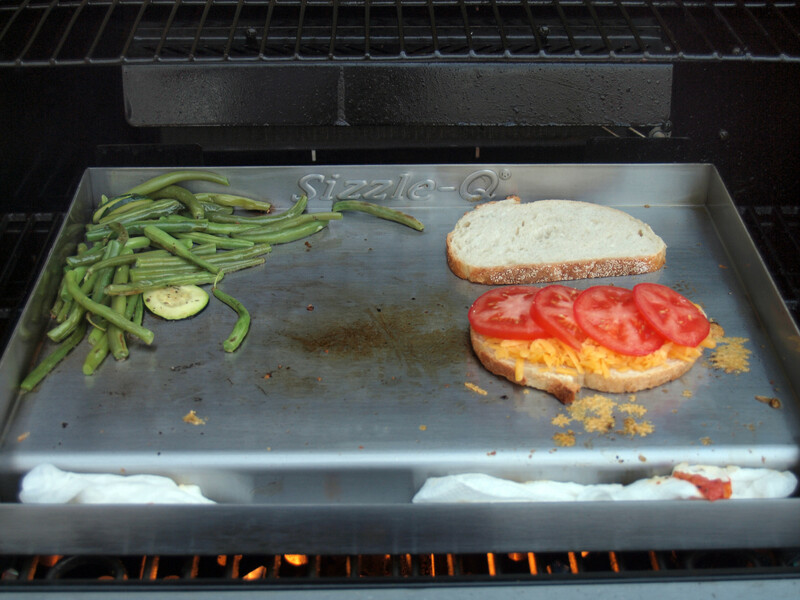 The Sizzle-Q is a heavy product that fits nicely on the grill, as you can see above. After spraying the Sizzle-Q and letting it pre-heat, I used it just as I would a saute pan. Honestly, I really wasn’t sure what to expect with the Sizzle-Q. I didn’t know how it would perform or how it would affect the cooking and flavor of a grilled cheese sandwich. I was intrigued. The outcome, as you can see in the photographs, is a grilled cheese sandwich that was cooked thoroughly, providing a great crunch with each bite. The Father was thoroughly impressed with the sandwich, including the flavor and crunch which is definitely a compliment to the Sizzle-Q (and of course Tillamook). He is not much of a foodie and doesn’t really make many comments about food, even my grilled cheese sandwiches, so when he does, we take notice. The main thing I was curious about was, would the flavor of the grill come through and is that something that I wanted? In my not-so expert grill opinion, I don’t think the flavor took on the typical grill flavors. However, depending on the person, this may or may not be an issue. To me, the way the grilled cheese cooked is more important than the infusion of the grill flavors. Sure, it would have been nice, but I definitely don’t see it as a negative. 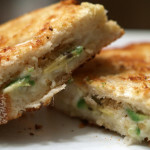 In addition to the grilled cheese, we sauteed some green beans on the other half, which was nice and provided for a great side dish to the well cooked and crunchy grilled cheese. The father requested that we use the Sizzle-Q again to make another grilled cheese sandwich. I made a very similar grilled cheese but this time we made some hash brown like side dish. The second use of the Sizzle-Q confirmed my first thoughts: It cooks food perfectly, providing a great crunch and crispness to everything. The new sandwiches were again crunchy and the potatoes were crispy on the outside and cooked perfectly. Overall, I would say that the Sizzle-Q was a success. I have to say, this experiment with great Tillamook Kosher Medium Cheddar and a brand new Little Griddle’s Sizzle-Q, was very successful. 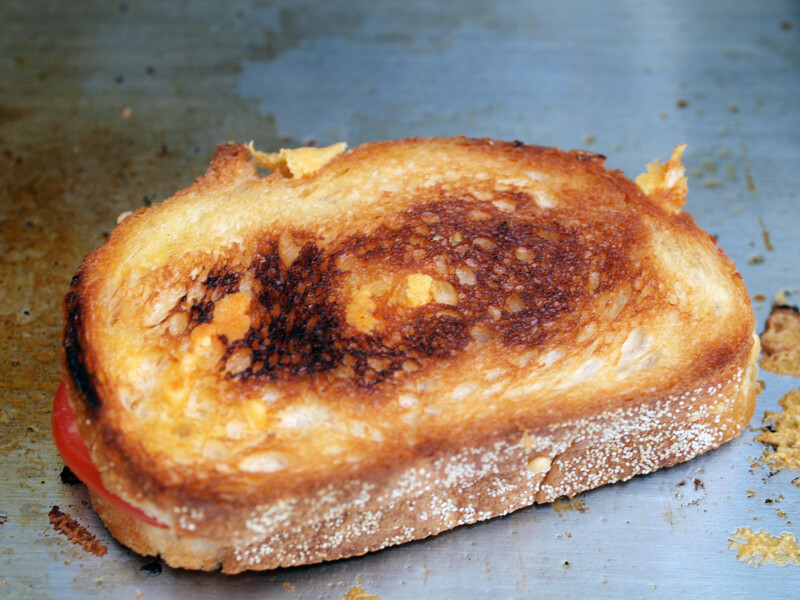 A crunchy outside thanks to the Sizzle-Q and a creamy but sharp inside thanks to the Tillamook Cheddar make for a delicious grilled cheese sandwich. Sure, it was simple, but that is what I was going for. 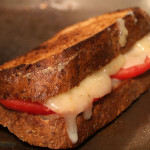 Add in the tomato and you have a successful grilled cheese sandwich. Editor’s Note: Thanks to Little Griddle, you are able to purchase your very own Sizzle-Q at a 10% discount by using the coupon code ‘grilledshane’. Get Shopping! 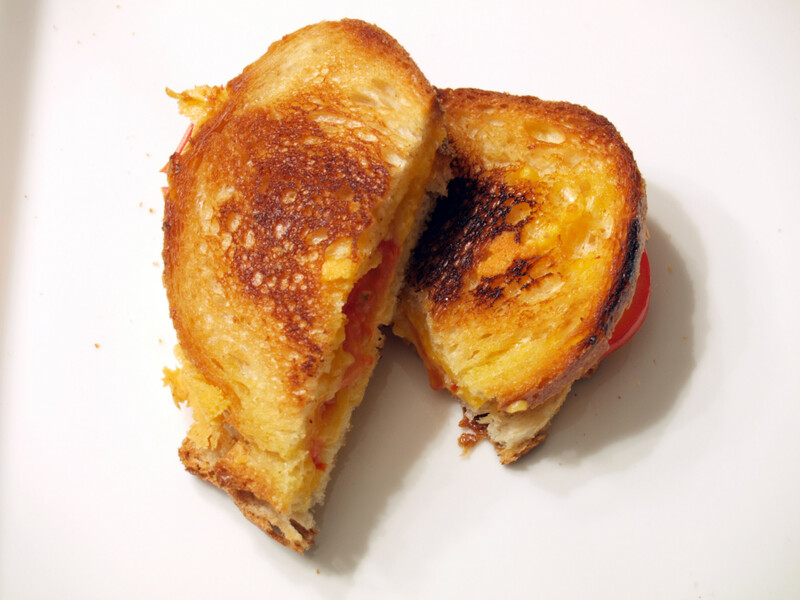 Posted in Grilled Cheese and tagged A, grilled, grilling, italian bread, kosher, little griddle, medium cheddar, tillamook, tomatoes.